Mosaic Creator is professional photomosaic tool. Creates large clickable thumbnails with unlimited number of cells. 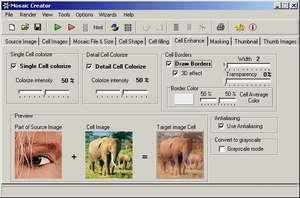 There is full range of options to control image distribution and enhanced rendering parameters. Result image size and number of used images is unlimited. Mosaic Creator 3.1 is a shareware program and can be used as a demo to try the software until the free trial period has ended. A full version of the program is available after the trial period ends. For security reasons, you should also check out the Mosaic Creator download at LO4D.com which includes virus and malware tests. Additional screenshots of this application download may be available, too.